-The HE-833MkII is a highly specified model and created with our leading state-of-the-art design techniques as a WAVAC Audio Lab special 10th anniversary model. -The power supply which uses technology from the SH-833 is a slightly compact version found in the top model, SH-833. By isolating the amplifier and the power supply sections, affects of induction and magnetic field coming from the power supply and the transformers are prevented and pure power is supplied to the amplifier. -The signal circuit eliminates a condenser and solidifies the dynamic range by using direct coupled circuitry and transformer-coupled. -All the tube heaters are rectified by Silicon-diode. The pi-shaped filter choke transformers are DC ignited by a large volumetric condenser to minimize hum noise. -Silver wiring is used for the amplifier signal path. 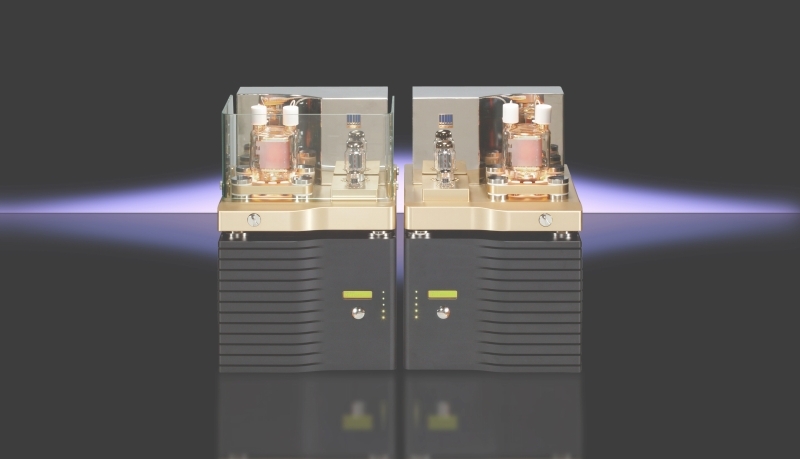 Gold-plated phosphor bronze terminals are connected to prevent signal deterioration and improve sound quality. -All the tube sockets are machined from Teflon and use high quality gold plated round pins made of phosphor bronze to improve sound quality by reducing contact and resistor between the tubes and the sockets. -CNC processed 60mm aluminum board with beautiful champagne gold aluminum finish is used for the main amplifier chassis. -Chassis employs pin pointed base and Beta-GEL as a vibration absorber. Vibration control machinery by Beta-GEL is also used for all the tube sockets to eliminate affects of vibration. Copyright © 1996- WAVAC Audio Lab. Co., Ltd.